KUALA LUMPUR: A faction of the Filipino rebel group Moro National Liberation Front (MNLF) has expressed its backing for Jamalul Kiram III, saying that the “Sultan” has all the rights to stake his claim on Sabah, Malaysia. However, reverend Absalom Cerveza - who is the head of the MNLF peace panel and from the faction belonging to MNLF founder Nur Misuari - stressed that “killing” and “war” are not the answers. Cerveza, when contacted by Astro Awani, claimed that the statement made by MNLF ‘chairman’ Muslimin Sema does not represent MNLF’s official stance. He stressed that Misuari is the one true chairman of MNLF and not Muslimin, who he claimed is merely the leader of a breakaway group of MNLF. Recently, Muslimin, who is also vice-mayor of Cotabato City in southern Philip­pines, said that MNLF was not enemies of Malaysia and was not aiding the Sulu incursion, an allegation which he claimed were intended to destroy MNLF. Muslimin also said that the MNLF recognises and respects the decision taken by the people of Sabah to join Ma­­­­laysia in 1963. However, Cerveza said MNLF stance differs from Muslimin's statement, saying that “the sultanate of Sulu have the right to lay their claim” as “historically and even present documents will prove that the sultan has the right to claim Sabah. Cerveza also said that the earlier reports about Suluks(or Tausugs) were sailing to Sabah by thousands to ‘avenge their fallen’ brethren was not exactly wrong. “I would not be surprised that there are already people planning to enter into the area into the area, through the back door...knowing the muslims for many years, I know they will not abandon their sultan even in this situation,” he said. Today, a report in the New Straits Times quoted WikiLeaks cable which revealed in 2007 that Nur Misuari had harboured a strong desire to “regain” Sabah and that he had close ties with opposition leader Datuk Seri Anwar Ibrahim. The secret cable was from the United States’ Embassy in Manila to the office of US Secretary of State in Washington where MNLF attorney Ombra Jainal had described Misuari as “a strong advocate for the recovery of Sabah”. However, Cerveza stressed that MNLF had “nothing to do” with what the sultan had done in Sabah, though he admitted that Misuari has been in talks with Jamalul. Asked if the MNLF support of the Kiram clan’s claim also meant that it condones the manner in which the intrusion took place, Cerveza expressed that he does not condemn anybody. “We do not condemn anybody. We do not condemn the sultan. We wish him the best,” he said. However, he again said that he did not want more bloodshed and said that unless Malaysia, Philippines government, and the Kiram family discuss this civilly, the standoff will continue in other forms. The standoff, which begun since the intrusion in Lahad Datu Feb 9, has so far left 10 Malaysian security personnel and at least 60 of the Sulu gunmen dead. Reports had previously quoted Misuari saying that he is willing to help in talks to resolve the Sabah stand-off peacefully. “It is my message to Malaysian Prime Minister Najib Razak that I am ready to send my grand-nephew who is his cousin to open up talks,” Misuari was recently quoted as saying. Misuari had reportedly enjoyed good ties with Malaysia in the past as it allowed the MNLF leader to seek sanctuary in Sabah. But Malaysian security forces also arrested him in Sabah in 2001, after he fled Sulu following a botched revolt in the province. 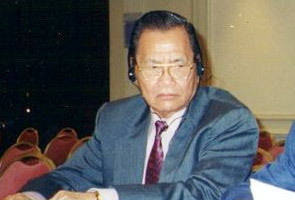 The arrest led to his detention in the Philippines.